This past weekend we went to our first swap meet of the season in Vancouver, at the Kitsilano Community Centre. Since these swap meets will start happening more often now, I thought I would share my lessons learned with you. If you don’t know what a swap meet is, then stop reading. Just kidding, a swap meet is an event similar to a flea market or a garage sale. The kinds of swap meets that I jam about are the swap meets where the sellers are parents who no longer have a need for the toys and clothes that their kids have grown out of (often contrary to their children’s beliefs), and the buyers are parents with kids who have a need for toys and clothes that other kids have grown out of. If you haven’t been to a swap meet yet, I highly recommend you check one out. You can get some great deals on some great stuff for your kids. In Vancouver, they are called swap meets, in your community they may be called something different. In Vancouver, they usually take place at community centres, in your community they may take place at the local firehall or on the side of the road. In any case, read on, you will find some good tips here no matter what your flavor of swap meet may be. Plan your strategy ahead of time: Do you want to be one of the first ones there to try and get all the best stuff before it is taken, or would you rather go later, when the best stuff might be gone, but the prices might be lower? If you choose the former strategy, be prepared to get there on time or even 15 minutes early (and even to wait in line when you get there). Pack your wallet with some extra cash too. Sellers are more likely to snub your negotiation attempts and look to the next anxious parent in line when everything is fresh and new at the start. You can get the top pickings right at the beginning, so if that is your main goal, then go for it. When you go later, the tables turn in your favour. Sellers start looking at their table of unsold trinkets and dread the thought of lugging it all back to the minivan, re-boxing it and going through the whole shennanigans of another swap meet again. At that point, your offer of $1.00 for a box of Duplo may be very welcome. Make sure you and your wife agree on your strategy: If your wife’s strategy is to get there early, and yours is to catch the tail end of things, it is not going to be pretty when she is rushing out the door and you are still reading the morning paper. Trust me. I had to learn this one the hard way. Choose your strategy together and make sure you are both on the same page with it. Don’t be afraid to negotiate: Your powers of negotiation will increase as the swapmeet dwindles to its closing hours, but that doesn’t mean you can’t negotiate at the beginning too. Don’t be afraid to negotiate a better price or ask to have something thrown in for buying a few items. Generally, people just want to get rid of the stuff. They understand what it is like as a parent to go shopping for the kids, so they will often be willing to do you a favour. It’s a win-win situation. Be quick, don’t hesitate: There is often only one of everything, so if you hesitate on something, you risk not getting it. If you see that My Little Pony you’ve always been longing for and the price is right, pick it up. Even if you end up regretting the purchase, you probably only paid a couple of bucks anyways, so its no big deal. You will probably regret it more if you wait five minutes to think about it, decide you really want it, then find out someone else just bought it. What’s worse: The person who just bought it gave it to their kid, who is happily playing with it, while your kid is having a tantrum because he can’t have it. So be quick. Chances are you won’t regret it. Bring bags: This may be a bit of a no-brainer, but is something that many people don’t really think about. You are not going to Macy’s or the local grocer. Some sellers have foresight and bring bags for their customers, but many do not. Unless you want to be carrying a pile of Spiderman figurines in your bare hands as you navigate through the swap meet crowds, you best bring a bag or two with you. Bring enough cash: Unless there is an ATM nearby, you may find yourself feeling strapped for cash if you find a must-have item that is on the pricey side right after you spent your last few cents on a Mr. Potato Head. Leave your expectations at the door: Don’t go to a swapmeet hoping to find something in particular, like a Thomas the Tank Engine Figure 8 Starter Set. Chances are you won’t find it and you are setting yourself up for disappointment. Keep your mind open and broad. Know what you want, but in general terms, like “Puzzles” or “Toy Cars” or “Clothes for the baby.” This way, you know what you are looking for and can stay focused on finding those things (if you plan on buying clothes, have an idea what size you need). You will likely find some version of what you are looking for, and if you happen to find some other great things at great prices along the way, then all the better. So, go in with an open mind, and don’t worry if you don’t find that perfect thing… you may find that perfect something-else instead. Decide on your child-strategy: Are you going to bring the kid(s) with you or leave them with the grandparents? This is an important decision. If you bring them with you, you best bring an extra set of eyes to watch them. Going by yourself with the kids is asking for trouble. There are so many people and toys everywhere. This makes treasure-hunting combined with not losing your child a near impossible task, no matter how good a multi-tasker you are. So if you decide to bring your kids, bring another adult with you (e.g. your spouse), and work out who will be the main treasure-hunter and who will be the main child-watcher. The child-watcher can buy stuff too of course, but has primary responsibilty for not losing the kids. 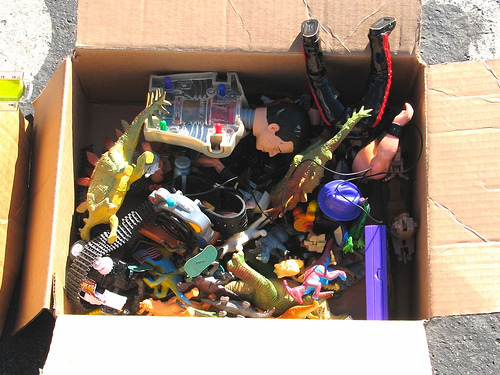 Set your kids’ expectations: If you bring your kids to the swap meet, they are absolutely going to find something, or many things, that they want in the seas and mountains of toys that await them there. Just as you would before going into a toy store, make sure your child is clear on what he or she will get and what he or she is and is not allowed to do. It is easy for your child to pick up a toy and just run off with it, so make sure he or she knows that doing that is not allowed (unless you want to see a seller chasing your kid across the room). Know what is reasonable to pay: There are some sellers that try and get top dollar for their stuff, and others that sell at reasonable prices. If you have an idea what is reasonable to pay (this may vary, depending on where you live), you can avoid overpaying. It can make the hairs on the back of your neck stand up when you buy a puzzle from one person for $3 and then move on to the next table to see that a brand new puzzle is selling for 50 cents. And trust me, it happens. You can usually pick out which sellers are there to get rid of their stuff and which ones are there to make a profit. Try and buy from the former. The latter are the ones that try and sell a piece of clothing for $5, while the former happily sell two of something similar for $1. To find upcoming swapmeets in your community, check out the websites of your local community centres. If you live in Vancouver, check back here often, because when I find out about swap meets that are happening in Vancouver, I will let you know about them here. I hope you enjoyed these tips and found them useful. If you have any tips of your own to share, or have any comments on these tips, please leave a comment! Thanks! Subscribe to The Dad Jam RSS Feed. Good post on “Swap meets”. This is really beneficial for the parents. 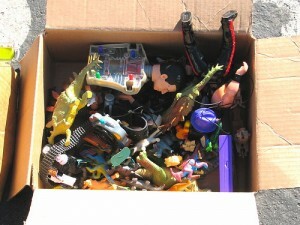 Wide variety of toys will be made available for kids at lesser cost. The strategies mentioned in the post are more helpful. Hey really useful post. I have an idea. I will try and initiate a swap meet in my area. Will be a good place for people to meet up, socialise and also swap stuff cheap. Thanks a lot. @Roy, glad you liked the post and the idea of having swap meets. They really are a great opportunity to meet and talk to other parents and get some good stuff cheap. I hope you manage to initiate one in your area, it could become a tradition! Good luck and let us know if you do! Swap meets have become sophisticated over the years. People are no longer shopping for hand-me-downs but specific toys and designer brandname clothing. Also sellers have become more sophisticated, home-made products, designer items. There are lots of other places to get a fair price for their goods Ebay, Craigslist, so be fair. You really have a great initiative! Instead of throwing old stuff that are not useful anymore you make them money of it. Good job!